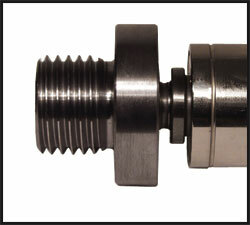 This accessory threads onto the Oneway Live Center (3/4" x 10TPI) allowing a chuck or faceplate to be mounted onto the live center in the tailstock. A chuck or faceplate can then be easily centered on the bottom of the workpiece being held on the headstock end of the lathe. The thread chosen should match your lathe spindle thread.